To be published in the IEEE/IFIP NOMS 2012 Conference Proceedings and IEEE Xplore®, at least one Author of an accepted paper is required to register for the conference at the full ComSoc Member, IEEE Member or Non-Member Rate and the paper must be presented at the conference. Non-refundable registration fees must be paid prior to uploading the final IEEE formatted, publication ready version of the paper. For authors with multiple accepted papers, one full registration is valid for up to three (3) conference papers. A workshop registration is mandatory for an accepted workshop paper. The workshop paper cannot be included into the 3 papers covered by the conference registration fee. If a workshop presenter wishes to attend the whole conference, he/she has also to register for the conference at the rate applicable. Please do not share your registration confirmation code with anyone else. Although the code enables submission of up to three papers, it can only be used once, by you, to create an Author account. 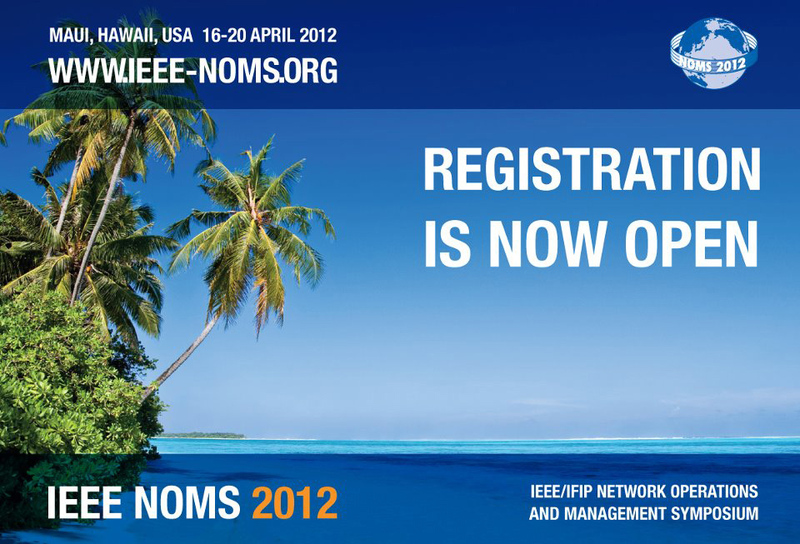 Accepted and presented papers will be published in the IEEE/IFIP NOMS 2012 Conference Proceedings and in IEEE Xplore®. IEEE reserves the right to exclude a paper from distribution after the conference (e.g., removal from IEEE Xplore®) if the paper is not presented at the conference. Student and IEEE Life Member registrations are not valid as an author registration. All workshop authors need to register by Monday, 13 February 2012. You may register for Workshops without registering for the conference. Workshops require an additional fee. Workshops are not included in any conference registration category. PLEASE NOTE: To be published in the IEEE/IFIP 2012 Workshop Proceedings and IEEE Xplore®, an author of an accepted workshop paper is required to register for the workshop and the paper must be presented at the workshop. Non-refundable registration fees must be paid prior to uploading the final IEEE formatted, publication-ready version of the paper. For authors with multiple accepted workshop papers, one workshop registration is valid for up to 3 papers in that workshop. Accepted and presented workshop papers will be published in the IEEE/IFIP NOMS 2012 Workshop Proceedings and in IEEE Xplore®. * There is (one) 1 FREE TUTORIAL offered with every registration. If it is necessary to cancel a workshop or tutorial, liability of IEEE/IFIP NOMS 2012 is limited to refunding the workshop or tutorial fee. Full ComSoc, IEEE or Sister Society and Non-Member Registration Includes: Admission to Keynotes/Technical/Application/Panel Sessions (Tues., Wed., Thurs. ), Mini-Conference (Mon. ), one (1) free Tutorial, one (1) copy of the Symposium Record on USB, coffee breaks and lunches (Tues., Wed., Thurs. ), Welcome Reception, and Banquet/Luau. Student or IEEE Life Member Registration Includes: Admission to Keynotes/Technical/Application/Panel Sessions (Tues., Wed., Thurs. ), Mini-Conference (Mon. ), one (1) free Tutorial, one (1) copy of the Symposium Record on USB, coffee breaks and lunches (Tues., Wed., Thurs.) and Welcome Reception. Banquet/Luau is NOT included with IEEE Student or IEEE Life Member Registration, but can be purchased separately. Authors may not register as students or IEEE life members. Tutorial and Workshop Only Includes: Tutorial or Workshop notes on CD-ROM and coffee breaks on the days of your Tutorial(s)/Workshop(s). Spouse/Companion Registration Includes: Welcome Reception and Banquet/Luau. Make your VISA arrangements for entry into the United States early. Such arrangements are the responsibility of attendees and other participants and may take up to a few months. Nationals of Visa Waiver Program countries will still be eligible to travel without a visa, but will have to obtain an approved travel authorization prior to their travel to the United States. VISA ASSISTANCE LETTERS: Authors, Non-Authors (Speakers, Committee Members, and paid attendees) requiring visa assistance letters, and/or authors needing a hard copy of the letter, must complete a ComSoc Visa Assistance Request (http://www.comsoc.org/node/add/visa-assistance-request).